This is NOT just another book on yoga poses, but a book that will do something no other yoga book has done. My aim ... to inspire you as no one has before. If you've tried yoga and failed ... if you've only thought about doing yoga, this book will get you off your laurels and doing it. Think you're unfit? Inflexible? Just “can't” do it? We'll make it together. Believe me: If I can ... you definitely can. "We have a saying in Russian ... When a person can't seem do anything right with her hands, we say: Her hands grow from the wrong place. Okay - it doesn't translate so well in English. But then, neither do I, at times. My legs grow from the wrong place. It had to be so - during my hip replacement surgery, my shiny new titanium components were positioned where existing bone structure allowed, not where they - re supposed to be on you entirely mortal humans. My doctors told me I'd never be able to stand on one leg, my balance being forever impaired. I'd never be able to bend more than 90 degrees at the hip, they said. And I'd definitely have a 'bad back,' said the doctors, because of the severe limp I'd endured for 45 years of my life. Finally, at age 47 I told them: 'Go watch General Hospital.' (Other phrasings came to mind. But this one seemed gentler.) I canceled my health insurance and started taking Bikram yoga." It took me 2 years and 10 months of regular yoga practice to be able to do the Camel Pose. Some of you might want to visit exotic places or win a marathon. Not me. My biggest wish was to be able to sit in the cross-legged position. I came to my first Hatha yoga class five years ago. Stephanie, my charming instructor, brought 4 blocks for me to sit on. Still I couldn't cross my legs - no chance of folding into a Lotus position. Then one day I discovered Bikram yoga. Hot stuff! It was then I realized that months of physical therapy and years in the gym had never done as much good for my hips as just one Bikram class. Not to say it was an instant cure. It took four years of regular Bikram yoga practice for me to increase the range of motion in my hips enough to achieve the Half Lotus Pose. As you can tell I am very proud of my accomplishment. If you're even vaguely familiar with the background of Bikram yoga, you know that Bikram designed the whole series to heal his own knee. Instructors often mention that the Fixed Firm Pose played a central role in his recovery. You may not know, though, that this isn't just a “knee pose.” It's great, too, for healing hip bursitis. Flash forward through two years of sharp pain ... I discovered Bikram yoga. Gradually mastering the Fixed Firm Pose got rid of my pain in just a few months. However, I had to practice this pose at the studio and at home for three more years before it became my favorite. But the effort was decidedly worth it. Not only is my bursitis gone, but the Fixed Firm Pose has become so natural that I can easily take a nap while in it. Pain ... to comfort and ease - that's the happy result of my yoga journey! Will you make it yours? Bending at the hip - that's my trouble. Any yoga pose requiring a bending at the hip is hard for me, and this pose is hardest of all. I started with no better than 90 degrees between torso and thigh at maximum. It took me a good three years before I could do this comfortably at all, and I still perform it only on one side, as this picture shows. Can I do this pose on the other side? No, I can't do it fully and correctly yet - not, at least, without much stretching beforehand. But I'm getting there. The human body is an astonishing example of cooperation. If one organ or part isn't working properly, the rest of your body wants to help. Example: when your right leg is shorter than your left, you'll limp with every step. Your left shoulder gets higher and all the muscles that go through the left ankle all the way to the right shoulder get compressed again and again. Walk like this for some 40 plus years, and your body becomes all skewed, as mine was. Now, the Head to Knee Pose, done with a left leg bend and trying to reach the right leg, demands the flexing of the very muscles compressed because of my limp. I might need another few months to get it right! Hi Tonya, I love your message and appreciate so much what you have shared. It is exciting! I got your message a while back about looking for people to share their Bikram and raw foods experience. 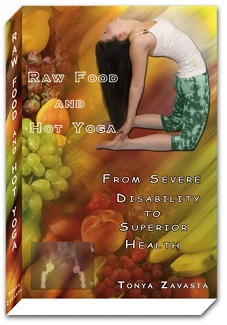 I have embarked on a 100 days of Bikram yoga and I am transitioning into a 100% raw foods experiment along with it. I read a wonderful description about what 100 days of consistent Bikram yoga does for you, so we shall see how it unfolds. I learned that in the first 30 days you remake your body, in the 2nd 30 days you remake your mind, in the 3rd 30 days the two come together and the last 10 days are a blissful finishing of what was started. They don't say anything about diet so I'm really excited to see the power of raw foods along with this great form of exercise. I am on day 4. I hope to be able to follow this path and have a great story to share with you. I'm going to keep a journal of the process. I started doing Bikram about 3 months ago after reading your book. I have gone about 2-3 times a week and have had great results so far. Happy New Year!